APTWREIS AP Gurukulam Entrance Test for Inter 1st year admissions in AP Tribal Welfare SOEs, COEs. 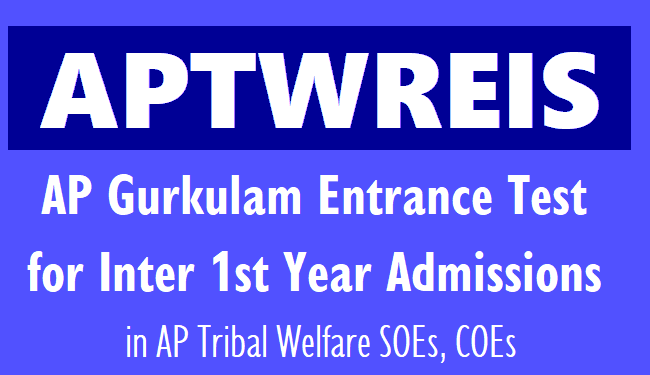 AP Gurukulam SOE and COE Entrance Test for Inter Admissions/ APTWREIS gurkulam entrance test 2019 for Inter with Integrated coaching/ APTWREIS GURUKULAM Entrance Test 2019 For Join into Inter with Integrated Coaching: ap gurukulam Inter 1st year entrance test 2019, aptwreis cet 2019, Inter admission test, ap gurukulam rjc cet 2019, ap girijana gurukula vidyalays Inter 1st year admissions, application form, last date,hall tickets entrance exam date details given here. The Gurukulam APTWREIS has issued Admission Notification 2019 for admission into Inter first year with Integrated Coaching for IIT/AIEE/JEET/EAMCET for the year 2019-2020 for its SOEs, COEs and IIT Study centre through Common Entrance Test 2019 which will be conducted by the Andhra Pradesh Tribal Welfare Residential Educational Institutions Society. Applications are invited from Boys & Girls for admissions into 1st Year Intermediate in English Medium for MPC & Bi.P.C Groups with integrated coaching for IITJEE/ AIEEE/EAMCET for the Academic Year 2019-2020 in the following institutions functioning in Gurukulam. The Gurukulam, APTWREI Society, Hyderabad has been running with institutions of Excellences COEs / SOEs/ IIT Study Center apart from RJCs for ST Students to provide necessary academic environment and inputs and also providing specialized coaching to meritorious ST students to enable them to compete successfully in order to get admissions into All India Level Institutes such as IIT, NIT, IIIT, Medical Colleges etc. The selections will be made on merit basis through Entrance Test conducted by Gurukulam. The selected students will get all benefits extended by Gurukulam such as free boarding, lodging, dresses, note books & text books, bedding material, medical care and examination fee etc. Sri Chukka Ramaiah noted Educationist will give academic guidance for the Institutions of Excellence. Regular IPE Syllabus with intensive coaching. Micro Plan for IIT, NIT(JEE) & EAMCET. Weekly, monthly, cumulative, Terminal & Grand Tests in IPE, IIT, JEE (Mains) & EAMCET. Study Material and reference books. Well experienced & dedicated faculty. Good Infrastructure laboratory & library. Individual Attention, Guidance & Counseling round the clock. Total free & quality education. 1. All the ST students (Boys & Girls) who are appearing 10th class March - 2019 in TW Residential Schools, Ashram Schools, Govt. Schools and other Govt. Recognized schools.and should have secured B2 grade(7 points) in aggregate and also secure B2 grade in English in SSC Public Examination 2019. 2. Students studying in Telugu / English Medium are eligible to appear for the Entrance Test. 3. Parental Income should not exceed Rupees One Lakh per annum. 4. Selected candidates have to produce necessary certificates like, Caste, Income, Ration card SSID No, Aadhar card. Marks Memo, Study, T.C; Physical fitness certificates, 06 Passport size photos at the time of admission. 1. 100% seats are reserved for STs only. All the eligible ST students only shall upload their details in online in the Gurukulam official website aptwgurukulam.ap.gov.in.The last date for the submission application form online is 25-03-2019.The hall tickets can down loaded from the web site itself after duly submitting the application form online. Applicant shall submit the filled in application form (A4 Size) and photo affixed hall ticket form to the Convener Principal of concerned district on or before 25-03-2019. Hall tickets will be issued by the convener principal immediately after receiving the application in person. No postal correspondence will be entertained.